Feature Book, Mc Kay. US. David McKay Publications is the oldest book publisher in the Prince Valiant world. Their "Feature Book #26" is printed in 1941 (PV #1-28,30-64). Sometimes noted as published in 1937, but this is the copyright date, not the printing date. David McKay was also publisher of the King Comics. They were publishing two issues with our Prince in 1940; nr 146,147 (PV #437-443). No pictures yet. 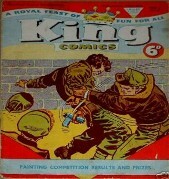 After that they did publish PV in at least the King Comics of 7th August 1954 (Volume 1 number 14). This issue include: Flash Gordon, Mandrake The Magician, Prince Valiant, The Phantom etc. 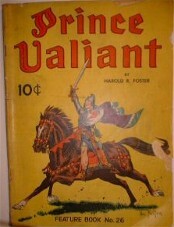 In 1973 there was one special PRINCE VALIANT published, nr R-08. This was a promo comic, to introduce Prins Valiant as a new or old serie.